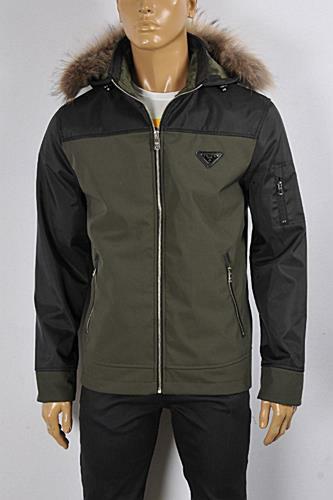 Stay warm on the slopes with this Prada Men's Jacket. Designed with a insulating down feather filing, zip front closure and side zip pockets it is the ideal layering piece for ski seasons away, or winters at home. Each piece of the collection is limited, so take advantage of this unique opportunity to take possession of some of the most coveted collections of designers. This Jacket is made of 100% polyester insight and 50% nylon, 50% polyester outsight, in green/black color. Shoulders (from seam to seam) 18½" 19" 19½" 20" 20½"
Width (from one armpit to the other) 21½" 22" 22½" 23" 23½"
Length (from neck seam to the bottom) 30½" 31" 31½" 32" 32½"
Sleeve 26" 26½" 26½" 26½" 26½"